Studio Maarten's Samsara Room may have given you the idea that this developer is weird in the most wonderful way. The point-and-click adventure game A Fall From Grace cements that by being about a space-faring couple who crashes their magical flying carrot and must reunite on a bizarre world by using the powers of good and evil to make rotten apple bridges, sail paper boats, and other completely logical things. Obviously. Click around to move and interact, and click the icon second from the left in the top bar to swap control from human, to angel, to devil and back. The human can walk between scenes and interact with most characters, while the angel and devil both influence creatures and the environment in different ways. Don't worry about making moral choices so much as proceeding, and click the far left icon in the upper bar to cycle between available items. Wait... what is that? Is that a... oh, it's your arm. I thought it was a... uh... pool noodle. There's weird and then there's A Fall From Grace, and with its strange imagery and gorgeous design, it snags your attention right away. Too bad the game suffers from being almost too weird in a way that makes it difficult to intuit what should come next, or even tell any sort of coherent story whatsoever. The best surreal games are those that work from their own rules but also have their own logic that the player can figure out and learn to work with and anticipate. 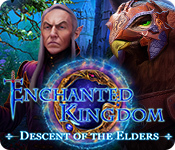 A Fall From Grace, unfortunately, is all over the place to the point of simply feeling random most of the time, and throw in some clunky navigation on top and you have a game with enormous potential that stumbles maybe a bit too much for all but the most patient gamer. I was also sort of hoping for more choice in progression, given the good-and-evil concept, but nope, it's dead bunnies for everyone, so sensitive folk might want to steer clear. It's a bit of a bummer, to put it mildly, since the game's formidable length, striking visual style, and clever concept have all the makings of a real winner, and a bit of streamlining and retooling would have put it head and shoulders above the rest. 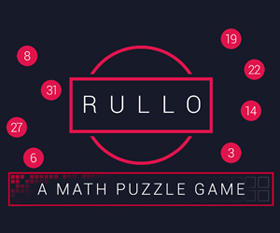 Some great ideas and fun, unique puzzles make this one still worth checking out... especially if you tend to think outside the box yourself. A Fall From Grace Walkthrough now available! Start by selecting the Devil wings, then click the black rabbit to kill it. Switch back to controlling the blue man and pick up the DEAD RABBIT from the ground. Walk to the right edge of the screen to travel to the next scene. Select the Devil wings again and click to kill the four rabbits, two are on the left side of the river and two are on the right side. For each rabbit you kill, one of the four bolts in the hanged man's tree will be raised. The hanged man will drop to the ground after all four bolts are out. Select the Angel wings. Click the man on the ground to move the wings over him, which will cause music and glowing squares to appear. Wait a few seconds for the man to be revived. Once he's up he'll walk straight to the paper boat, allowing you to move across. Click the man to control him again, then click the boat to enter it. Continue right across the river and on to the next scene. Select the Angel wings once again. Move them over the small plant sprouting out of the ground. While the wings are over the plant it will grow until it becomes a tree. Switch back to the man and click the tree to take an APPLE. Approach the old man with the net. He'll request 5 black and 5 white butterflies from you. Click the window on the metal structure to start a puzzle. Move the sliding tiles to arrange them into a complete picture. 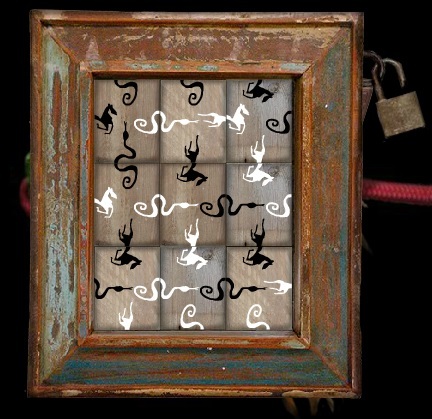 Once the puzzle is solved, click the opened door to enter the room. First select the Angel wings and move them to the sleeping person in the cradle. White rings should appear from the sleeper and float into the pipe in the ceiling. Switch back the man - making sure not to move the Angel wings away from the cradle - and step outside. The white rings you saw from the sleeper will leave the pipe at the top of the metal structure as white butterflies. Return control to the Angel wings, then click to move it in front of the pipe. Wait for 5 white butterflies to fly towards the Angel wings. Slowly move to the right to lure the butterflies towards you. Have the white butterflies follow you all the way to the old man, who will catch the butterflies in his net. Switch back to the blue man and return inside the metal structure. This time, select the Devil wings and move them over the sleeper. His dreams should then change to shadows of dark horses. Select the blue man again to travel back outside, then return to controlling the Devil wings. Just like you did with the Angel wings, move the Devil wings in front of the pipe to attract 5 black butterflies. Lure the butterflies into the old man's net. Now that he has 5 white and 5 black butterflies, you can switch to the blue man and talk to him to receive some FUEL. Walk right to move to the next scene. Click the odd hammer creature to speak with it. It wants you to sacrifice a black rabbit. Place the DEAD RABBIT on the ground in front of the creature, who then complains that this rabbit isn't alive. Switch control to the Angel wings, then click the rabbit on the ground to bring it back to life. Return to controlling the blue man and click the live rabbit again to sacrifice it. Talk to the hammer creature again and take the HAMMER from it. Select the Devil wings and try moving them around. You'll see that the right hand moves to point at the wings. Position the Devil wings to the left of the right hand to make it point straight across the gap between the cliffs. Now switch back to the Angel wings. These wings are followed by the left pointing hand. Move the Angel wings to the right side of the left to lift hand upwards. When the left hand meets the right hand, the two will connect to form a bridge. Select the blue man and walk him across the bridge, then continue right into the next scene. Click the door at the bottom of the lightbulb structure to get a closer look. Examine the pattern at the top of the board. There are six points and above each point is either a dark or blank circle. The points in the drawing represent the spires of the lightbulb structure. The dark circle indicates a bulb that is off and a blank circle is a bulb that is on. Therefore, the order from left to right should be: Off, On, On, On, Off, On. Select the Angel wings and move it between the fourth and fifth bulbs to turn on all the bulbs except the far left one. Next, select the Devil wings and move it directly on top of the fifth bulb. Now that the light bulbs are ready, click the door to zoom in again. This time, inspect the three white rabbits under the black arrows and the three black rabbits under the blank arrows. Move the rabbits so that the white rabbits are under the blank arrows on the right and the black rabbits are under the blank arrows. Click a rabbit to move it forward into an empty space. A rabbit can also hop over another rabbit of the opposite color if it is next to an empty space. Rabbits can only move forward and not backward. Click the arrow above the right blank arrow if you need to reset the puzzle. First move the right white rabbit (C) forward into the blank space between the arrows. Next, click the left black rabbit (D) to hop it over the white rabbit and into the space under the right black arrow. Now click the middle black rabbit (E) to position it under the left blank arrow. Click the right white rabbit again (C) to move it under the middle blank arrow. Click the middle white rabbit to jump (B) it into the blank space between the arrows. After that, click the left white rabbit (A) to move it under the middle black arrow. Click the left black rabbit (D) one last time to position it at the far left black arrow. That's one rabbit done! Click the middle black rabbit (E) to hop it to the right black arrow. 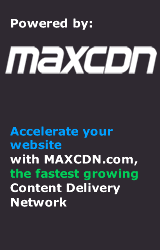 Now click the right black rabbit (F) to move it to the left blank arrow. Click the right white rabbit (C) once more to position it under the right blank arrow. Next, click the middle white rabbit (B) to move it to the middle blank arrow. Click the left white rabbit (A) to hop it into the empty space between the arrows. Click the middle black rabbit (E) to position it under the middle black arrow. Now click the right black rabbit (F) to move it under the right black arrow. Finally, click the left white rabbit (A) it to place it under the left blank arrow, completing the puzzle. 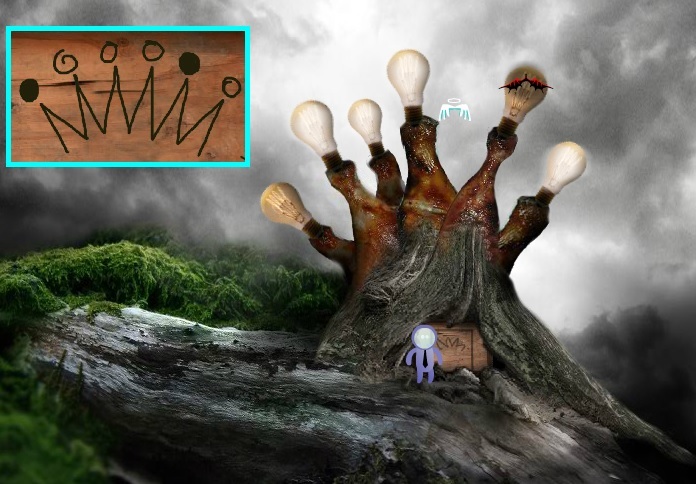 Once both puzzles are solved, select the blue man and click the door to enter the cave. Try to grab the key hanging from the string to receive a clue: "Free the beetles, make them green." To solve the beetles puzzle, arrange the spider webs so that none of the threads cross over the beetles. Click and drag the webs or the beetles to move them on to any square on the grid. Each web has a vertical, horizontal, and four diagonal threads that extend to the edges of the board. When a beetle is free, its color will change from red to green. Turn all three beetles green to complete the puzzle. 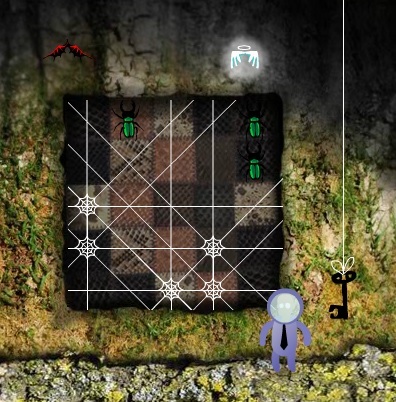 This puzzle has multiple working solutions, including one that is indicated on the cave wall in the next room. After the puzzle is solved, take the lowered KEY. Continue right to the next scene. Use the KEY to remove the padlock at the top of the rabbit's wheel. Walk all the way to the left until you reach a scene with another cliff, a creature in a green robe, and a couple giant apples. Click the green creature to learn that it wants you to grow a tree and bring it an apple. You've already taken care of the first half, so now you can give it the APPLE from your inventory. Select the Devil wings. 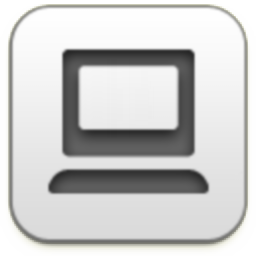 Click the knot in the white string near the upper right corner of the screen. The Devil wings will burn the string, which drops the right giant apple down beside the right cliff. Next, select the Angel wings. 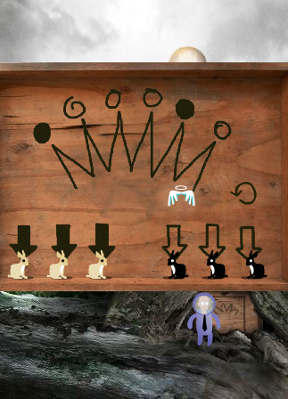 Move the Angel wings directly above the hole in the left cliff to lure the two rabbits into the hole. Once both rabbits are down in the hole, the left giant apple will be raised to complete the bridge between the two cliffs. Switch back to controlling the blue man and walk him across the bridge and to the left to the next scene. Select the Angel wings. When you move the wings around, watch how the carrot the green figure is holding will follow your movements. First position the Angel wings so that the green figure aims the carrot at the higher basket. Click the carrot to make the figure fire into the basket. Make sure the bullet is not just ricocheting off the edge, it needs to land right inside. You can select the wings and move them again if you need to re-adjust the aim. After a shot lands in the basket 5 times, the snake's mouth will open halfway. Now reposition the Angel wings so that the carrot is aimed into the lower basket. Click the carrot to fire bullets into the lower basket until the snake's mouth is completely open. Select the blue man, then walk down to the twig and into the snake's mouth to re-enter the caver from the right side. Select the Devil wings and move them to the rabbit on the wheel. The frightened rabbit will start to run, which will spin the wheel and operate the snake tongue mechanism. Switch back to the blue man and return outside the snake by walking to the right. Move left across the snake's extended tongue to enter the next scene. Examine the cupboard to start another puzzle. Each tile has a picture on all four sides that has been split in half. You must arrange them on the board so that all the adjacent tiles have complete pictures of two correctly connected halves. For example, if a tile has a white snake head then it must be next to a white snake tail. Click and drag a tile to move it, then release it to place it on the board. Take the KNIFE from the opened cupboard after the puzzle is solved. Use the KNIFE two times on the man with the long beard to cut out a RIB from the blue man. Give the RIB to the bearded man to make it float in the air. Select the Angel wings and move them on top of the rib to make it into the pink woman. Switch back to the blue man and click the pink woman. Follow her all the way back to the carrot rocket ship. Repair the carrot with the HAMMER and then fill it with the FUEL from your inventory to complete your repairs. Click the carrot to take off. Haha, thanks for the noodley note. My contribution for the moment. 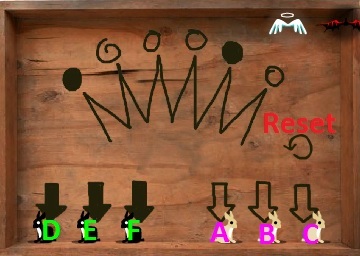 Screenshot of the puzzle solution for the 3rd screen on the beach. 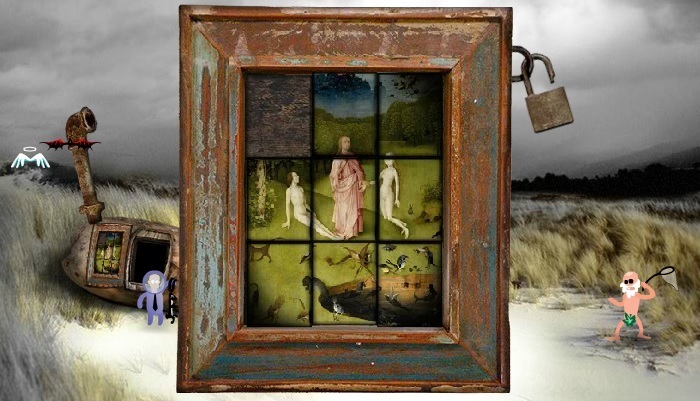 Wow, a Hieronymus Bosch sliding-panel puzzle! Never thought I'd see that. Beat by the slide puzzle. Even knowing what it's supposed to look like, I can hardly ever get em. I hit an error. The man just disappeared after I had him pick up the dead rabbit and go into the distance to talk to the hammer guy. Hate the slide puzzle. But the worst part of the game is the terrible pathing. If you enter the screen from the right you should be able to click the exit on the left and the character should walk to it on his own (or else it should just automatically go to the next screen) rather than having to manually finagle with clicking on just the right spots to get him to cross some narrow path.